Taft-Peirce INDICATOR MOUNTING BRACKETS by Suburban Tool, Inc. Designed to work on our 9205 and 9209 model bench center beds. 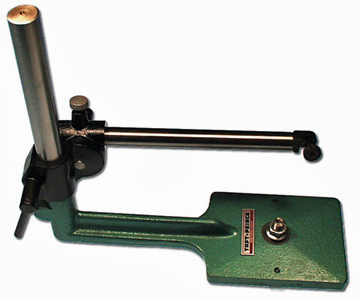 Integral clamp designed to accommodate any standard lug back dial indicator. Keyed to base t-slot and may be positioned anywhere between the centers and locked into place. The indicator bracket allows the indicator to be adjusted up or down, and swung 360° horizontally, vertically or axially.